The Princeton Board of Health unanimously approved the introduction of an ordinance last week that would ban the sale of tobacco and electronic cigarettes to people under the age of 21. The board will hold a public hearing on the ordinance and vote on final adoption at its monthly meeting. The meeting is scheduled for Tuesday, April 21, at 7:30 p.m. at 1 Monument Drive. A new report released by the Institute of Medicine just this month found that raising the minimum age to purchase tobacco products to 21 would reduce smoking by 12 percent. Public health benefits related to the projected decline in smoking from raising the age to 21 would take years to realize, but would be significant, according to the study. The Institute of Medicine estimates that there would be 249,000 fewer premature deaths, 45,000 fewer lung cancer deaths and 4.2 million fewer total years of life lost among those born between 2000 and 2019 if the minimum age to purchase cigarettes is raised to 21. Non-smokers would also reap benefits. Between now and 2100, 286,000 fewer babies would be born prematurely and the effects of secondhand smoke on children would diminish, according to the study. Princeton Board of Health Member George DiFerdinando Jr., who helped develop the new ordinance over the last several months, said not only could premature deaths be prevented, but the quality of life could also be improved for many if smoking is reduced. Currently, the state age requirement for purchasing tobacco products is 19. But municipalities can adopt more stringent ordinances. Englewood, Sayreville, and Teaneck have enacted similar laws raising the age requirement for purchasing tobacco products to 21. The Princeton ordinance covers tobacco products and nicotine delivery products, including e-cigarettes, other types of smoking devices, liquids, powders, other forms of tobacco. Cigarette vending machines and self-service displays already banned in Princeton. Princeton’s Department of Health would be charged with enforcing the ordinance. Officials would periodically perform undercover operations to see if merchants are following the law. The penalty for selling or providing cigarettes to people under the age of 21 would be $250 for the first violation, $500 for the second violation, and $1,000 or more for third and subsequent violations. The board of health could also suspend the retail food license of any person convicted of a violation. The suspension could last for up to three days. Officials hope local business will be proactive and decide not to tobacco products and e-cigarettes. CVS voluntarily made the decision last year not to sell tobacco products. Target stopped selling cigarettes in 1996. ONE of the world’s largest tobacco firms has launched a legal bid to halt the Government’s controversial plain packaging measures, the Irish Independent can reveal. Japan Tobacco International (JTI) formally lodged papers in the High Court yesterday which names the State, the Attorney General and Health Minister Leo Varadkar as defendants. While tobacco firms have previously threatened legal action over the plain packaging measures, JTI is understood to be the first firm to launch a legal bid. The cigarette giant, which owns the Benson & Hedges and Silk Cut brands, is seeking to halt the plain packaging plans on the basis that the European Court of Justice is hearing a case that bears directly on the right of an EU member state to introduce such measures. The company will argue Ireland is operating outside of the parameters of EU law. 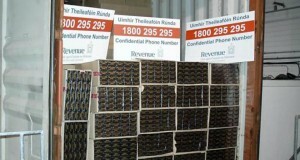 Customs officers seized more than 10 million cigarettes in Dublin Port over the weekend. The 10.3 million ‘Don Corleone’ brand cigarettes had a retail value of €4.7million, a spokeswoman for the Revenue’s Customs Service said. A mobile scanner found the cigarettes concealed in a 40-foot container which had arrived into the port from Belgium. The cigarettes were described on the manifest as “paper handkerchiefs”. “These seizures are part of Revenue’s ongoing operations targeting the supply and sale of illegal cigarettes in the shadow economy”, Revenue said in a statement. “ If businesses or members of the public have any information regarding the smuggling or sale of illegal cigarettes or tobacco, they can contact Revenue in confidence on free phone number 1800 295 295”. All outdoor drinking and dining areas in Melbourne’s CBD could be made smoke-free, if a proposal by the Lord Mayor is approved by the Melbourne City Council. Quit Victoria said the move would make Melbourne the last Australian capital to introduce the ban, despite broad public support. Director Sarah White said in areas where the ban was already in place, trade at cafes either improved or remained the same. “If you speak to families, they don’t want to take their children to sit outside at outdoor cafes, and the children will be subject to smoke drifting over from the next tables, so I think it would be a huge benefit for our culture,” Ms White said. Lord Mayor Robert Doyle told 3AW it was time to have a discussion about stricter smoking measures. “I reckon most smokers these days, if they’re in an area outside dining they won’t sit there and smoke, they’ll go and smoke somewhere else,” he said. “I don’t think it’d be a great imposition. Premier Daniel Andrews told Gold FM the proposal was worth considering. “I can tell you as somebody with three young kids if we go out for breakfast we can’t really sit outside,” he said. “One of our kids, our youngest kid Joseph, has asthma, so the outside area becomes the default smoking area and therefore a whole lot of families can’t enjoy that. The government yesterday said it would consider a total ban on electronic cigarettes after the city’s anti-smoking watchdog called for a ban on the “personal vaporisers”. Hours after the Council on Smoking and Health (Cosh) presented its survey results, Secretary for Food and Health Dr Ko Wing-man said the government was “inclined to agree” with the council’s request due to some proven health risks. “There is also a risk that youngsters would pick up smoking [traditional] cigarettes after they begin smoking e-cigarettes, which is why we are inclined to accept Cosh’s recommendations,” Ko said. He added that detailed studies would be required before they could proceed with legislation. A University of Hong Kong telephone survey of 2,400 local residents found that only 1.8 per cent of respondents used electronic cigarettes. But the council insisted that a preemptive approach was still needed. E-cigarettes – “personal vaporisers” used as an alternative to tobacco – can be sold legally in Hong Kong if they do not contain nicotine. Any product with more than 0.1 per cent nicotine is required to be registered with the Health Department. Professor Daniel Ho Sai-yin, of HKU’s department of community medicine, said new findings about harmful ingredients in e-cigarettes kept emerging. Apart from nicotine, Ho said e-cigarettes had also been found to contain carcinogenic chemicals such as formaldehyde when ingredients were heated at high temperatures. The council also dismissed as “misleading” claims made by manufacturers that they can help smokers quit traditional cigarettes, and the products were non-addictive or eco-friendly. Young people were particularly vulnerable as e-cigarettes were usually marketed as the “affordable alternative” to traditional cigarettes, the council said. The survey – which covered smokers, non-smokers and former smokers – also revealed that non-smokers aged between 15 and 29 were more likely to start using e-cigarettes. Citing World Health Organisation advice for e-cigarettes to be regulated in a similar way to traditional products, the council said the ban should cover the sale, advertising, promotion, sponsorship, distribution, import and manufacturing. KIEV, Ukraine, March 30 /PRNewswire/ — The most recent edition of the authoritative Tobacco Atlas, released by the American Cancer Society and World Lung Foundation, ranks nations on their success in combating illegal sales of cigarettes and tobacco products. The report confirms that the Ukraine, with a population of 45 million people and despite porous borders, has the extremely low rate of 1.7% of its total market in contraband tobacco. The Ukraine utilizes the EDAPS Tax Stamp System to control the illicit sales of products. The Ukraine rate of 1.7% is 8 times better than the results in Switzerland, 7.5 times better than the UK, 15 times better than Italy, 3.5 times better than the United States, 20 times better than Brazil, 23 times better than Greece, 15 times better than Malaysia, 8 times better than Turkey, 46 times better than Iran and 13 times better than neighboring Russia. In the years studied, one of the largest areas of trade in illegal cigarettes was Eastern and Central Europe as show by 607 seizures of 100,000 or more counterfeit cigarettes. In the Commonwealth of Independent States, 20 percent of all cigarettes consumed – some 100 billion – were illicit. Yet among 196 nations studied, the Ukraine has one of the lowest percentages of illicit cigarettes consumed. The well-established EDAPS Tax Stamp System utilized by the Ukraine has resulted in more than doubling the legitimate sale of tobacco, alcohol and other products, and has resulted in billions of dollars in savings for that nation. By comparison, tax stamp systems deployed in other nations have resulted in annual tobacco tax losses: USA – $5 billion, Canada – $2.4 billion, UK – pounds Sterling 4.5 billion, Germany – $7.2 billion, Malaysia – 0.6 billion. “By combining state of the art holograms with our enforcement methodology and Track & Trace System, we are enabling government agencies to substantially increase their revenues from the sales of excisable products while shutting down illegal uses that often fund transnational criminal and terrorist activities,” said Alexander Vassiliev, Chairman of EDAPS. The Secretary General of the prestigious World Customs Organization has previously singled out the Ukrainian system of protecting goods with tax stamps with holographic security elements developed by EDAPS. “This system is a good example for other states,” said Michel Danet at a Global Congress on Combating Counterfeiting & Piracy. “The key role of our organization is to provide reference information and inform government institutions of the methods of protecting goods from counterfeiting. These methods become more complicated while shadow market dealers develop new methods of counterfeiting not only products, but security elements as well,” the Secretary General concluded. EDAPS offers Digital Tax Stamps but with overt security (such as holograms). Digital Tax Verification systems from other vendors are easily imitated – relying on a number (printed as a 2D barcode and/or a human-readable number to be verified on-line or by phone). A counterfeiter can print a similar tracking number, provide a false toll-free phone number & website, so an inquiry sent there will yield responses required by the counterfeiter. In the absence of a comprehensive enforcement methodology, overt security and due to the fact that very few will bother to call or check on-line the cigarette pack number, digital tax verification from other vendors has not delivered any significant results anywhere in the world. A comprehensive solution by EDAPS has a proven track-record of overcoming these obstacles and generating billions of dollars in additional tax revenue. Challenging economic conditions around the world have motivated many nations to review their tax stamp operations in an effort to hold back losses and convert to a solid profit picture.